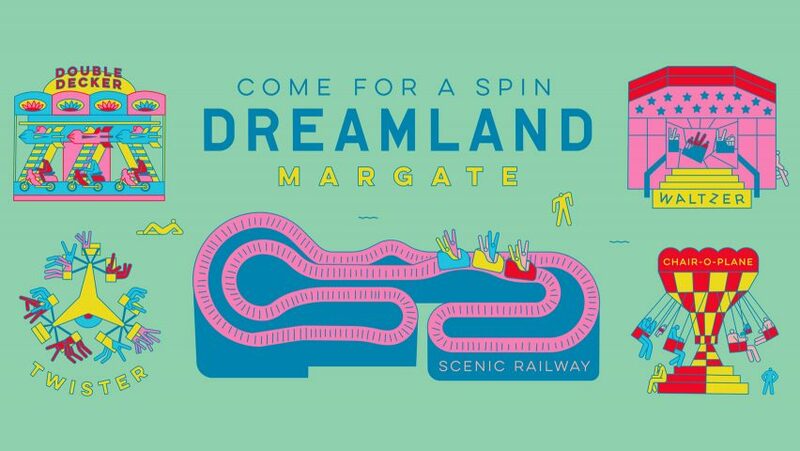 London-based Studio Moross has created maps, icons, posters and an entire set of food truck logos for Margate's recently reopened Dreamland theme park. The park is located in the English seaside town of Margate, and dates back to the 1800s. Studio Moross – led by art director and designer Kate Moross – was first approached to create a new set of standalone food brands for the park, which relaunched this year after going into administration in 2016. Moross designed a different identity for each food truck, using animal characters and different typefaces to match the food being served. The studio also designed overarching branding for the park's food area – dubbed The Friendliest Food Court Ever – creating a set of giant smiley-face logos with interchangeable eyes. "We try not to get bogged down in demographics," Moross told Design Week. "We just tried to make something that someone will look at and think 'that's cool' – whether they're five or 45. We wanted to keep it slightly weird and fun, but not patronising." To accompany the park's reopening, and renewed focus on hosting music, Moross also created a set of illustrated music-festival-style posters and maps, made in partnership with artist Mica Warren. "Illustrations have been a key lead on everything," said Moross, who set her studio up in 2012, having made several music videos, as well as work for Topshop and Vogue. "They're bright and colourful, and feel fresh, modern and eye-catching." "A lot of theme parks use photography in campaigns, so we hope this will set us apart from other similar events." The studio chose a new sans serif typeface, which has been paired with a palette of green, orange, yellow and pink. Posters highlight the park's new live music lineup, as well as its food truck offering and collection of rides and amusements. The studio plans to work with a set of different illustrators across the course of the next year to evolve the graphic identity – which it hopes will play a key role in attracting locals as well as those travelling from London. Although it dates back to the 1800s, when the site was first used for rides, Dreamland didn't start going by its current name until the 1920s. It shut in 2005, and reopened ten years later with a redesign by Hemingway Design and Ray Hole Architects – which was a Designs of the Year 2016 nominee. Artist David Shrigley also harnessed the power of illustration earlier this year for a series of posters urging the Conservative government to "keep Britain kind".